Known for magically making an entire bag of treats or jar of peanut butter disappear in seconds, Mena admires like minds. So last year in May, the merlin herself made it out to see David Blaine as he spent a week in a water-filled ball in Lincoln Center. He was napping when she stopped by, you can see his feet sticking up. He later escaped 150-pounds of chains after holding his breath for nine-minutes. A little more than a year later, the next guy who also started out whooing crowds with street magic pulls off his public escape. Criss Angel was just west of Times Square hanging in this concrete filled box. He had to escape before the box came crashing to the ground. 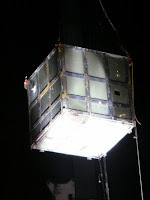 The stunt was to promote Angel's new season of illusion and magic on A&E. Angel has been promotion mode for a while. On Oprah last month, he broke Houdini's record of escaping from a straight jacket while hanging upside down. The illusionist has also been traveling the country signing his book and DVD's. In his book, Criss reveals how some of his stunts are performed. And that is where he and Mena are similar. She too, likes to unveil the mystery. For example. The time she ate an entire pan of brownies that were left on the top of the refrigerator. Okay, so you think, the brownies must NOT have been put up high like thought. Doubts cloud your mind as to how something you specifically remember doing must not have happened. 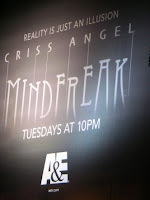 As Criss says, Reality is Just an Illusion. But then, the trick made known. Standing in the kitchen one day begging for treat, Willamena did a standing jump to land with all fours on the waist-high counter next to the refrigerator. From there, the brownies would have been within easy reach.